MADAME MEDUSA PRODUCTION CEL WALT DISNEY STUDIOS GOUACHE ON CEL, 1977. 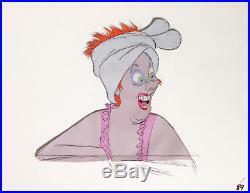 Original hand-painted production animation cel of Madame Medusa from "The Rescuers, " 1977, Walt Disney Studios; Numbered 89 in ink lower right; Set on a lithographic background; Unframed. Measurements: Size - Madame Medusa: 9 x 9 3/4", Image 9 3/4 x 15 3/4". Condition: See pictures below of the actual cel, which is in excellent overall condition as shown by the pictures below! All items we sell are from a smoke-free/mold-free home/workplace and are in excellent condition unless otherwise noted. I own every work pictured for sale and I stand behind every item. Please follow/bookmark me as a favorite and keep and keep checking back for more items for sale in the coming weeks. For now, please check out my other Drawings and Cels and other original modern and contemporary artwork for sale! 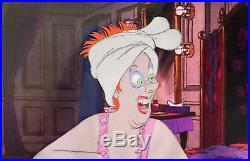 The item "1977 WALT DISNEY THE RESCUERS MADAME MEDUSA ORIGINAL PRODUCTION ANIMATION CEL" is in sale since Thursday, March 08, 2018. This item is in the category "Collectibles\Animation Art & Characters\Animation Art\Production Art". The seller is "shadowline" and is located in Durham, North Carolina. This item can be shipped worldwide.